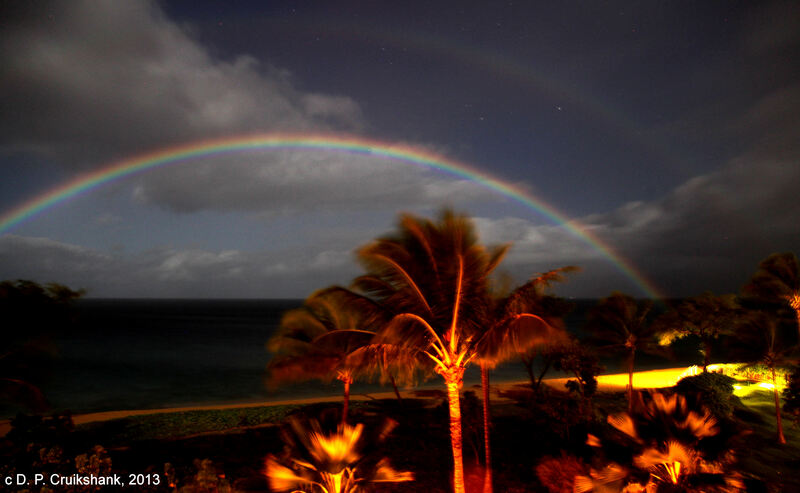 Dale Cruikshank took this 20 second exposure at F4 with a 28 mm lens from Kaanapali, Maui at ~9:30 PM on Feb. 26, 2013. Nothing inspires like a LUNAR DOUBLE rainbow! A moonbow (also known as a lunar rainbow, white rainbow, lunar bow, or space rainbow) is a rainbow produced by light reflected off the surface of the moon (rather than from direct sunlight) refracting off of moisture in the air. Moonbows are relatively faint, due to the smaller amount of light reflected from the surface of the moon. They are always in the opposite part of the sky from the moon. Be sure to also check out the video compilation of 162 photos of the 2012 annular eclipse taken by Dr. Dale Cruikshank at the Grand Canyon in Arizona. 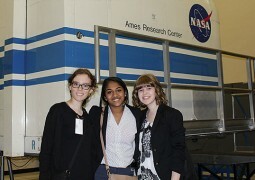 Dr. Cruikshank is one of the premier astronomers and planetary scientists in the Astrophysics Branch at NASA Ames Research Center, Moffett Field, Calif.